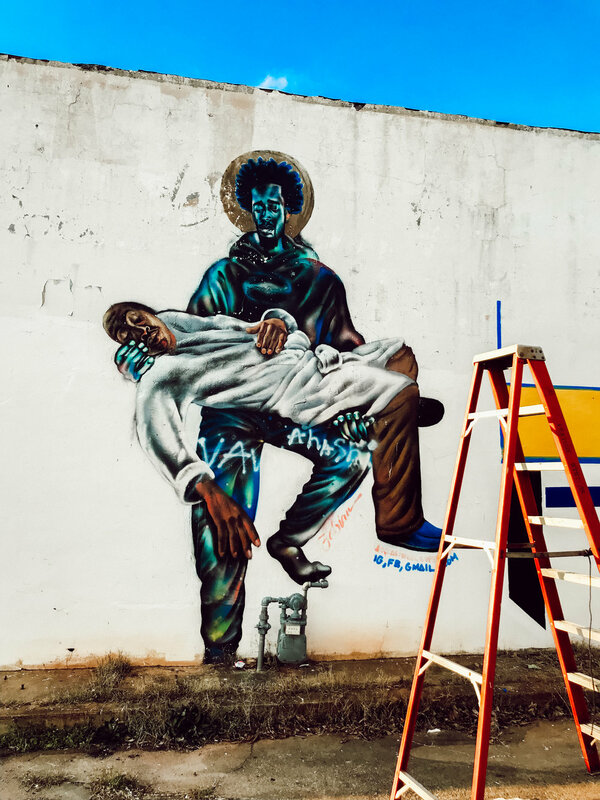 On the corner of Fair Street and Joseph E. Lowrey Boulevard, there was an abandoned building that hosted a triumphant mural of Colin Kaepernick sporting an Atlanta Falcons jersey. The artist, Fabian Williams (Occasional Superstar) created the piece after NFL owners failed to offer Kaepernick a new contract. “I thought Atlanta, because of our civil rights history, would be a perfect place for him,” He said. Apparently, the city had been complaining to the owner of the building regarding the mural. Then two days before Super Bowl Sunday was hosted in Atlanta, the building was torn down. 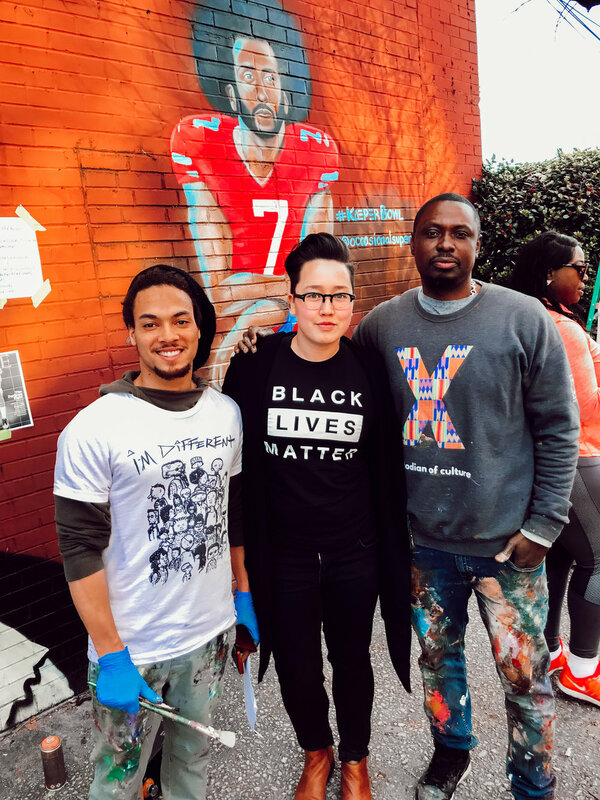 NFL Super Bowl comes to Atlanta, Kaepernick mural is torn down. Try to tell me that’s a coincidence. To put it lightly, people were upset. For me, it felt like Atlanta trying to “clean up” it’s image—trying to say, “this is a non-issue” when police brutality and the violence against black bodies is definitely still an issue. But the people acted quick. 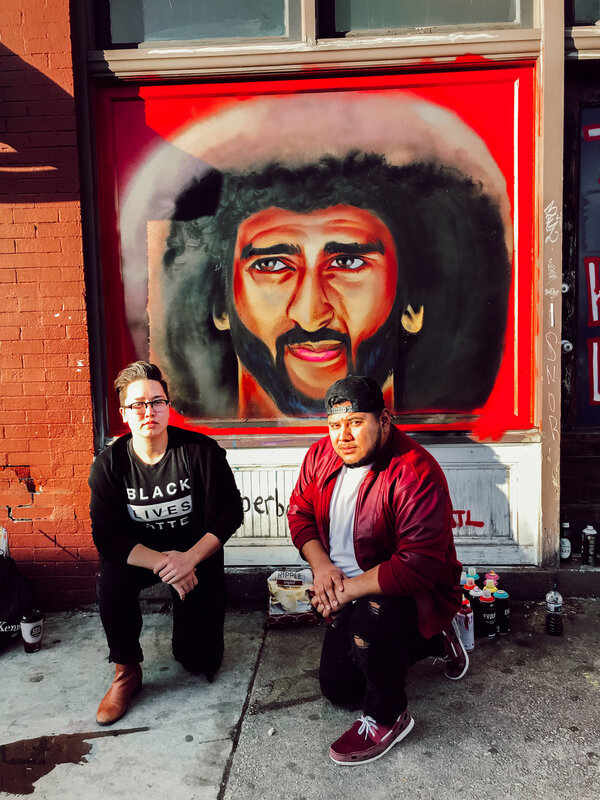 Overnight Williams got permission from building owners, gathered local Atlanta artists and put up SEVEN new Kaepernick murals—coining it the #Kaeperbowl. The first piece completed was SO CLOSE to the stadium that most people driving to the game would have to pass it. When my friend Leo and I went to go find it, the parking lot attendant who let us stop for a minute told us it went up around 5AM that morning. Another artist we met said they got the call around midnight the night before. We got to meet some amazing Atlantans as we traveled from neighborhood to neighborhood yesterday. I even recognized a couple artists I was familiar with from the Signs of Solidarity that preceded the 2017 presidential election. As I stood next to the last mural we were able to get to, the person capturing the image for me asked me a question. What does this mural mean to me? What do all of these pieces mean to me? I appreciated the fact they made me stop and think. I appreciated the opportunity to take a moment to truly reflect on the significance of what was literally happening before my eyes. Standing in front of the sixth piece I had seen that day, it felt like power. You knock down one, we put up seven. Try us, I dare you. It stood as a reminder that we haven't forgotten. We will not be silent to this violence against black bodies—the violence that continues to affect our nation and murder our loved ones. We will not cower to the organizations and people who try to silence the outcries of this violence. We stand with one another. It is a statement that we as a city can come together. So—what do these murals mean to you?